Month five was one filled with lots of family and snuggles. Landon got sick right after Hurricane Harvey devastated the Texas coast, and thankfully, we were able to reach his doctor’s office to have him checked out. 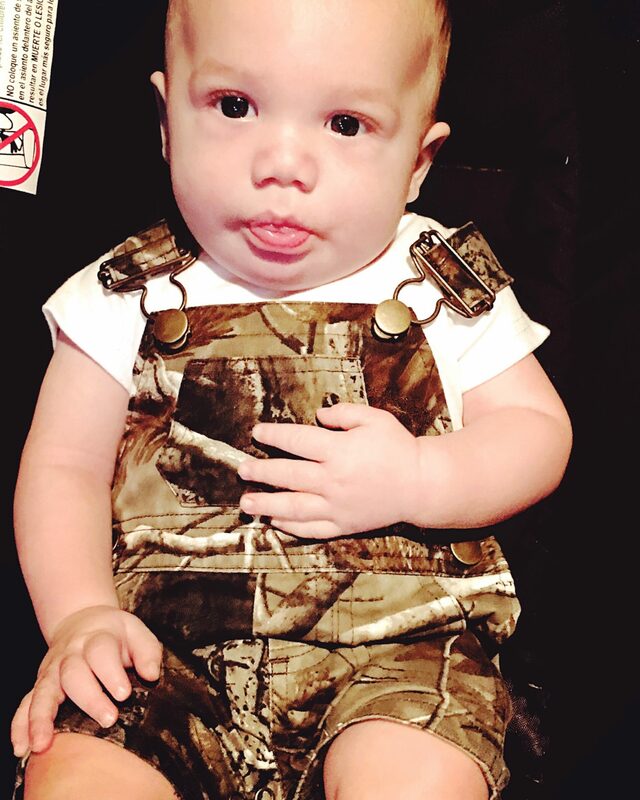 He was diagnosed with RSV Bronchitis and double ear infections – and my mama heart absolutely broke upon hearing the news. We added two new medicines to his routine and the follow up visit resulted in beginning breathing treatments! Landon absolutely HATES them, and we have to administer them every 4 to 6 hours around the clock. Yes, I’ve had to wake a sleeping baby on more than one occasion which goes against every fiber in my being. However, if we can manage to keep him asleep, he takes the treatment like a champ because he’s already breathing, which is all the treatment requires, and he’s not awake to hate it. So it’s a win-win! Until you pick him up to try to administer the treatment and he ends up waking up. Then he’s just mad at you for waking him up AND because he hates the treatment. Life has been hard these past few days and I am extremely thankful for family to help out! 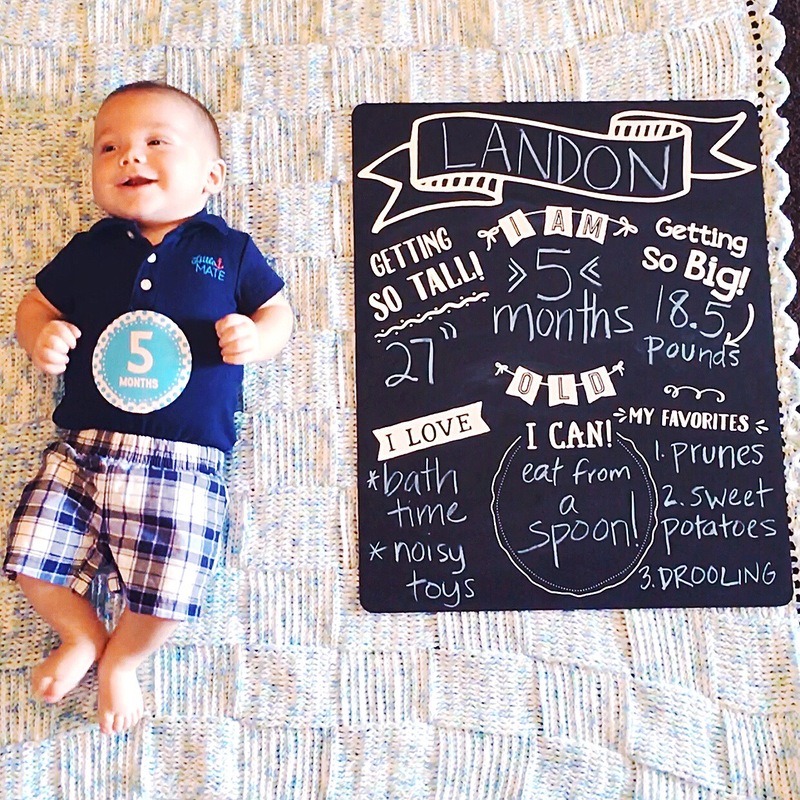 But before Landon got sick, month five was fun! We started eating solids for breakfast and dinner, and although the first few days/weeks were tough with him learning, he is now a champ at eating from a spoon! He opens his mouth and let’s you know when he’s had enough. I’m so proud of our sweet boy! He’s growing so fast and is constantly learning. I am still so unbelievably thankful to be this boy’s mama! Watching him learn and giggle and coo and sleep – I just can’t get enough of any of it! However, I could definitely do without all the fussing, but I know it’ll pass soon enough. He’s such a sweet boy and we just adore him. Picking his outfits to wear each day is still a favorite of mine, although he’s outgrowing his clothes SO FAST! Boxing up the old clothes is bittersweet, but it’s always exciting to get to a new size and wear all the new clothes! He’s now 18.5 pounds and is 27″ long. Our little milk monster still loves to eat, and I have a feeling his palate will increase in the next few weeks/months. I can’t wait to see what this next month will bring!